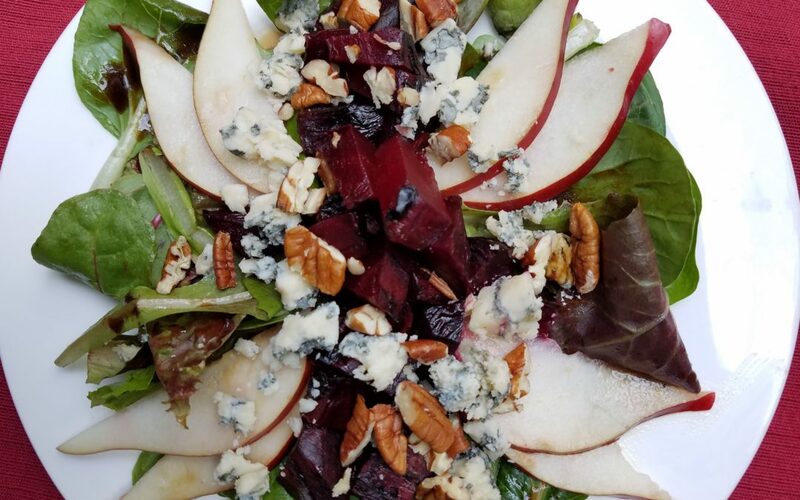 To capitalize on great tasting fall seasonal ingredients, try this wonderful salad featuring not only pears, but also a few favorite companions – fresh beets, nuts and blue cheese. For the blackberry vinaigrette, use a good quality blackberry balsamic. If none is available, substitute a traditional balsamic, fig, or sherry vinegar. This salad requires a small amount of planning ahead in order to prep the beets. They can be roasted and cooled while the other salad items are being prepped, or done up to 2 days prior to assembling the salad. Preheat the oven to 400 degrees. Prepare a small baking dish by spraying with cooking spray. Set aside. Strip the thyme leaves from the stems; discard stems. Set aside. Remove the tops and the roots of the beets and peel each one. Cut the beets in half and place into a small mixing bowl. Sprinkle the olive oil, thyme leaves, salt, and pepper over the beets. Toss to coat. Transfer the beets to prepared baking dish. Place into the oven and roast for 35 to 45 minutes, turning occasionally, until the beets are tender when pierced with a sharp knife. Remove from the oven and allow to cool. When cool, cover and refrigerate for at least 1 hour or up to 2 days. When ready to use, slice or dice the beets. Place the pear slices into a small bowl. Sprinkle the lemon juice over the slices and gently toss to coat. In a small bowl, whisk together the olive oil, vinegar, mustard, shallot and basil until emulsified. Add the salt and pepper and whisk until combined. Allow flavors to blend for at least 15 minutes. Use immediately or store in a tightly sealed container for up to 2 weeks. Remove the beets and pears from the refrigerator 15 minutes prior to serving to bring to room temperature. In a large mixing bowl, place the mixed greens. Pour a small amount of the vinaigrette over top and toss to coat. Only add enough vinaigrette to lightly coat the greens. Divide the dressed greens between individual salad plates. Top each serving with the pears, beets, cheese and nuts. Drizzle a small amount of vinaigrette on top of each serving to finish.